Vulcanized natural rubber sponges make a great dry cleaning sponge. This sponge has found many uses due to it ability to clean without the use of water or detergents. The sponge surface with its many pores pulls dirt from a soiled surface into the center of the sponge. It works well on wood, metal, painted surfaces and fabrics. The sponge is intended to be used completely dry with only light pressure needed (do not scrub). It is often used to clean materials damaged from smoke and soot after a fire. A great product for over-head cleaning without dripage. Although recommended for dry usage it can also be used wetted with most non-solvent based cleaning solutions. It is easily cleaned for reuse many times. The small sponge measures 6" x 3" x 3/4" thick. 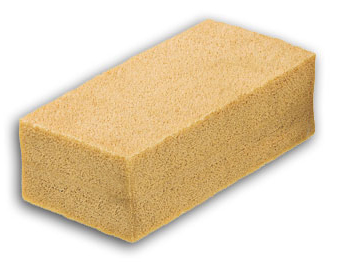 The standard sponge measures 6" x 3" x 1-3/4" thick. The extra large sponge measures 7" x 4" x 2" thick. Call for pricing on larger quantities.